The Pine Barrens is part of 1.1 million acres of the Pinelands National Reserve, which ranges from northern Ocean County south and west, and occupies 22% of New Jersey's land area. It is the largest body of open space on the Mid-Atlantic seaboard between Richmond and Boston, covering vast areas in Ocean, Burlington, Camden, Cape May, Cumberland, Gloucester and Atlantic Counties. This vast region is 45 percent, or about 493,000 acres, publicly owned. There are numerous State parks and forests here, including Brendan T. Byrne, (formerly Lebanon), Wharton, Bass River, Belleplain, Island Beach and Colliers Mills. There are also many county and municipal parks throughout the area. 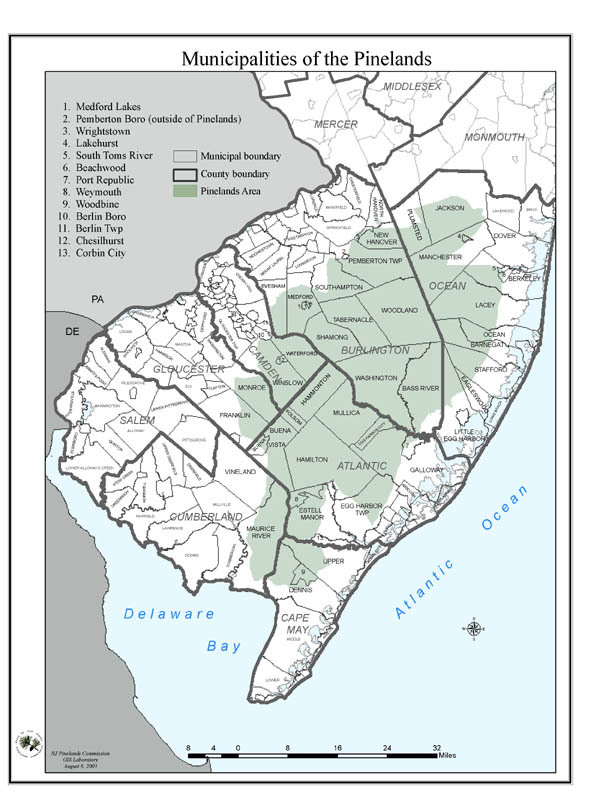 The adjacent maps of the Pinelands are courtesy of the New Jersey Pinelands Commission. Click on either one to view an enlarged version. For a detailed interactive map of the Pinelands in pdf format that includes most roadways, click here. DID YOU KNOW....That you can view detailed maps of every county in New Jersey from NJ DOT's website? 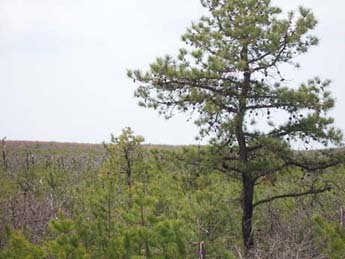 The "pygmy" pines, a stunted variety the pitch pine, can be seen at their best on Route 72 which runs northwest from Stafford Township through to Burlington County and beyond to the Philadelphia area. County Route 539, running from Little Egg Harbor north, also has many great views of these mysterious trees in the southern area. Further north on 539 you'll find the "Forked River Mountains" . Many think that the terrain is flat in Ocean County. It may not be the Rockies, but there are many scenic vistas from this region where one can see for miles. several groups and organizations, such as the Forked River Mountain Coalition offer hikes through this area. The hills are gently sloping for the most part and much of the footing is "sugar sand". The pines throughout this area live in a mutaully beneficial relationship with oaks. The oaks grow tall, eventually blocking out the sun to the pitch pines, causing them to weaken. Fire is actually a friend to the pines. With the intense heat of the flames, the pine cones "pop", allowing the seeds to sprout, thereby bringing about new growth. Driving long Route 539 south of Route 72, you can see the site of the forest fire of 2007 that burned over 16,000 arcres of Pinelands. Here stand hundreds of pines, some of which are dead, but others have sprouted new branches after their old ones were burned Pine saplings are now growing, as are other species of flora indigineous to the Pine Barrens. Many cedars can also be found in the region. The wood of the cedar was once a valued commodity in building. Red cedars were valued for chest and closet linings and the white cedars for the many fishing boats which residents depended upon to make a living in the bays. Today many local craftspersons use cedar for creating a multitude of items. Its berries are a popular food for many birds, and its foliage is heavily browsed by white-tailed deer. Generations of families have lived "off the land" here in the Pine Barrens; their stories are rich and colorful. Many "forgotten towns" are scattered throughout the region. 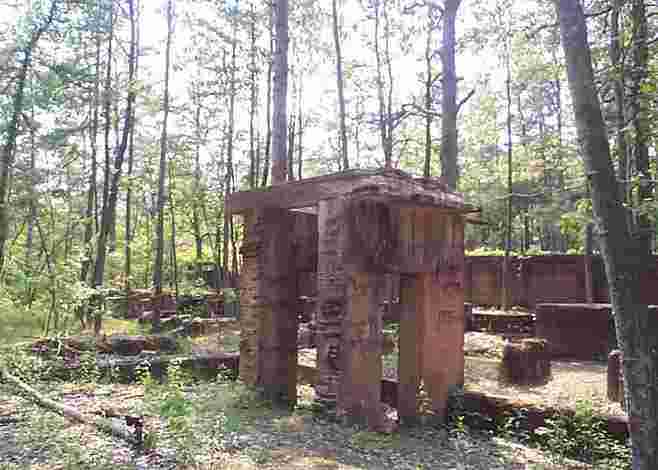 A drive along the many dirt roads which wander through state forest can go right by the ruins or foundations of towns that were once bustling with activity. Two great books describing the history of towns both thriving and forgotten, such as Ong's Hat, Eagle, Harrisville, Waretown, Calico, Mount Misery and more, are "Forgotten Towns of Southern New Jersey" and "More Forgotten Towns of Southern New Jersey", by H.C. Beck. To see some wonderful photos of lost towns, be sure to visit Michael Hogan Photography, or South Jersey Unpaved, another site with great photos and many good links, especially for 4WD fans. A favorite spot of mine is the Brooksbrae Brick Factory, sometimes referred to as the Pasedena Terra Cotta Factory. It was destroyed by fire in the early 1900's, but the remains are still there, tucked away about 20 yards from the roadway off Route 72 in Burlington County, near Brendan T. Byrne State Forest. Remains of the paper mill in the lost town of Harrisville can be seen off Route 679 in Washington Township. Although locked behind a chain link fence to prevent both personal injury to visitors, and damage to the delicate remains by unthinking trespassers, it presents a nice photographic opportunity without having to hike deep into the woods. A few towns of yesteryear have been preserved and/or restored, and are a great vacation destination. Double Trouble State Park in Berkeley Township, Whitesbog Village in Browns Mills, and Batsto Village along the Mullica River in Wharton State forest all have a number of buildings still standing. Q. What is the address of the Pinelands? A. There is no one "address"; the Pinelands encompasses over a million acres, and within that area lie several forests and parks. 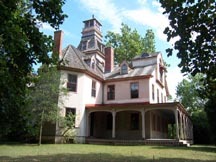 The largest is Wharton State Forest (609-561-0024). 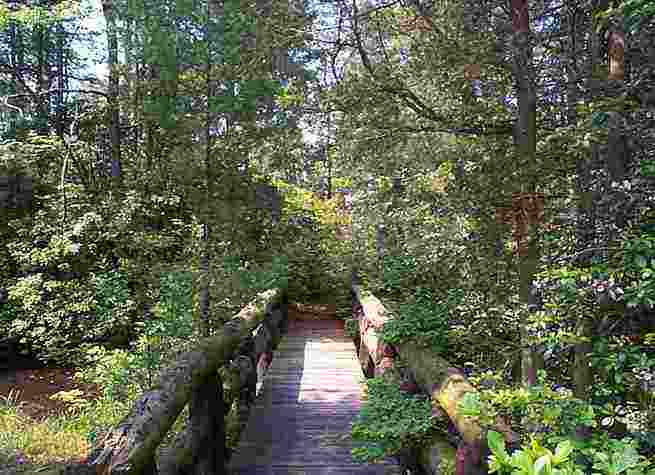 Throughout this website are many links to individual parks. Please follow them for more details. Q. How do I get to the Pine Barrens? A. Again, with over a million acres, there is no one road. As a general guide, the Garden State Parkway from Exit 82 to Exit 13 is the easterly boundary; parts of Mount Holly, Medford, Williamstown and Port Elizabeth are the westerly bounds; and mid-Cape May County to the south and Plumsted in the north mark the north-south. Please look at the map or see directions to get a better idea! You'll see that the Pine Barrens Preservation area is in light/dark green. Q. What's the difference between the Pine Barrens and the Pinelands? A. The PINELANDS refers to a political area, as defined by both the State of New Jersey (to define the Pinelands protection area) and the Federal government (for the purpose of defining the Pinelands National Reserve.) The Pine Barrens is a geographical region contained within the the Pinelands and other similar areas throughout the world, consisting of sandy acidic soil, where the predominate trees are pines, oaks, cedars blueberries, cranberries and other acid-loving plants. Q. Where will I see Pineys? A. You'll see Pineys everywhere; running stores and banks, buying groceries and clothes; and even working in the cranberry and blueberry fields! In other words, Pineys are just like everyone else - rich and poor; listless or inspired; friendly or closed-mouthed; and so on. The thing to remember is that Pineys love and respect the Pine Barrens, and when we see anyone coming here and destroying what we love, we get upset. That includes tearing up our woods with ATV's without regard to the plants and animals that live there, much less the people who have lived off this land for centuries. STAY ON THE ROAD, whether it's blacktop or sugar-sand. A. Only when they see their Pine Barrens being destroyed by uncaring visitors, or when trespassers appear on their private property. Q. Where can I go off-roading? A. Any vehicle that is permitted on a public roadway, i.e., registered and insured, is permitted within STATE forests on the dirt roads. Many roads are marked PRIVATE, so stay out. There are hundreds of miles of dirt roads within the million acres; it is very easy to get lost out here. Get a good map and also keep in mind that your cell phone may not work in the woods. Please stay on the roadway. 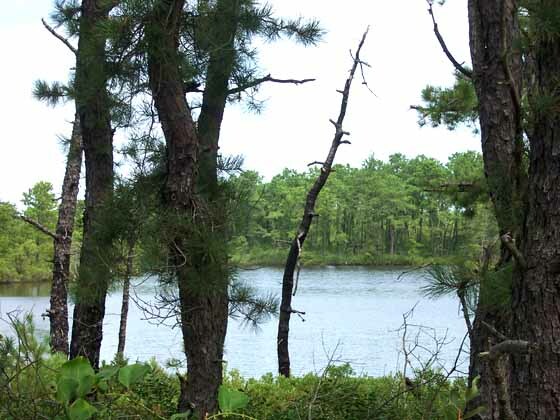 The Pinelands is a habitat for many rare plants and animals, and when you roar through a vernal pond, you may be destroying larvae and rare carnivorous plants! Q. Where can I get information mailed to me? A. Try calling the NJ Pinelands Commission at (609)894-7300. The Pine Barrens is becoming a popular tourist destination. It offers history, nature, boating, camping, fishing, swimming, and most of all, peace and tranquility. It's important to families who live here, whether for a few years or many generations, that our peace and tranquility be preserved.A local lawyer or doctor won't look any different than his neighbor who works the land. Thousand dollar suits aren't what impress people of the Pines - taking care of nature and fellow man is what matters. To that end, it is important for you to know that as a visitor to our precious Pine Barrens, you should show respect for the flora and fauna, for the historical buildings or their remains, and show respect for the "locals". Walk and drive gently. Treat our Pine Barrens as you would want a visitor to treat your own home town - and your own family. Thank you. Please note: Unless otherwise noted, all articles and photographs on this site are the property of PineyPower, and as such, may not be reproduced without written permission.